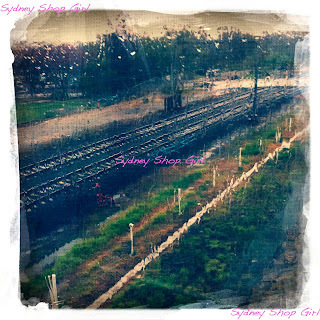 Sydney Shop Girl: Rain. Does Kate Love J Brand Even More Than I? Rain. Does Kate Love J Brand Even More Than I? Did anyone else look out the window today and wonder if this rain will ever end? I'm actually also a little deaf from the steady drumming of raindrops on rooves and windows. I'm also a little frightened because it has been bucketing down for 14 hours straight. I only know this because I got a clear break for my run this morning and it was down pour from then on. To add to the chaos in Sydney today, Costco's first store opening here magnified the usual traffic chaos on Parramatta Road by a factor of around 987 462. There were variable message sign warnings well before the evening peak hour(s) were meant to start. Truth be told, I'm just a little fragile today. Dr Nina chose Dr Patrick and not Dr Chris in Offspring's season finale last night. I know that she had to choose a real but imperfect love over one that was based on dreams and what ifs for so long but I'm still gutted. I am ashamed to say I did the diehard sports fan act last night and turned off the television the moment it was clear my team was not going to win. Still, there's not much else a girl can do but brush her hair off her face, swing her stethescope around her neck and stride purposefully into work with a defiant smile on her face. 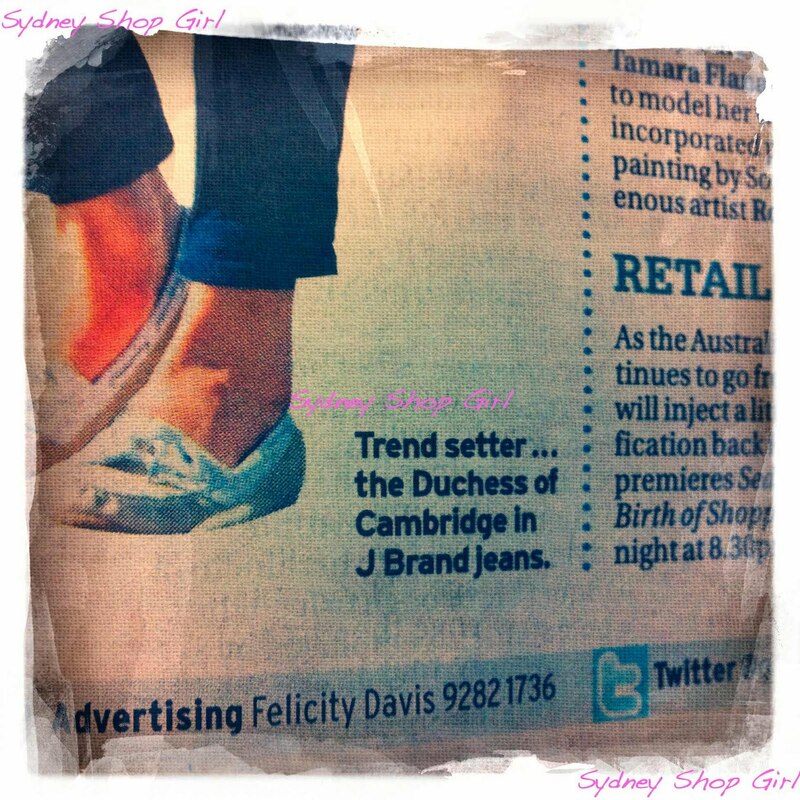 It was just as well I did because the Duchess of Cambridge was in the SMH today. And if I hadn't been so organized today, I wouldn't have brought the paper in with me to work today. The article was about the influence of women with constructive and prominent roles in society who are not only role models but also a source of fashion inpsiration for other real women. I will not rise to the bait of an oblique but sarcastic reference to spokes models at this point. I will not. Moving right along. Will you look at that caption? The Duchess is a J Brand lover too. Apparently this has been a major windfall to the Australian importer of the brand. They are struggling to keep Australian stores stocked because J Brand is flying off the shelves (even at Australian 'high cost of everything, we have to factor in the price of carbon and rental' prices). Such is the power of Kate. Okay. Yes I did. Go to the Revolve site and have a browse. And a one click purchase. My only defence is that for once the price in AUD was much cheaper than in USD. If that's not a reason to keep up with the Duchess of Cambridge, then I don't know what is. All will be revealed when Revolve's expedited, free international shipping has worked its magic. Take care and stay dry - tomorrow is Friday! I love J Brand..... So much. the rain is out of control. the building where i work is very poorly built and it was leaking all around the edges of the outer walls! Team Patrick. That is all. I am sorry about your weather - we are having the same up here in the Northern Hemisphere only its supposed to be summer here. Almost put the heating on last night! Offspring sounds like my kind of show - I'll look online to see if I can find an episode. I spent half an hour in traffic on Cleveland street last night in the rain. Haha I bet it's the Costco queue gone errant :P Have a great weekend SSG-stay dry! Gosh I'm hoping more of HRH ladylike style makes its way here. I'm loving her dresses, it can be so hard to get nice dresses with sleeves that don't look like Nanna wear. Send the rain down to Canberra, everything is crisp and brown here. Oh and I'm totally team Patrick, I was cheering and had to ring my Mum for a catch up after the show. I'm a bit devastated about the end of the season though. Lisa: don't worry, if I could, I'd send you some rain. It's getting crazy here, it's been 3 days!! Lorraine: there wasn't a road out west last night not affected by Costco. Mrs E: you need some Offspring escapism! miss E: that is a great idea! Safety in numbers. Bug: good to hear you're spreading the word! AFW: I wonder how many pairs is too many? I think your quota may be higher than mine though, on account of you probably needing to wear jeans more days of the week for life on the farm. Oh the beloved USD! How you make me want to shop and shop and shop. By the way, I love the new look. I wish we could get Costco here. We don't even have Ikea Family for goodness sake! The Weekend Is Nearly Over. The Problem With Bricks and Mortar Retail. Technology Finally Went My Way Today. Twitter. Tuesday Night Thoughts and TLC. An Image For Every Minute Of the Day. My Good Winter Coat. Monsters and Muggles. The Land of the Buses. Good Food Sunday. Dark Chocolate Speckles. Covetting on the Fourth of July. Orange Remains in the Collective Consciousness.